There are a lot of comic book inspired movies that have hit theaters over the years and it has always been hit or miss with all of them. It is never an easy thing to bring to life what so many fans have held in their hearts for so many years. But there have been a select few that were able to become huge successes in theaters. Having an excellent cast is one key component, a good director who knows how to translate it properly, and finally a good story. A perfect example of this formula is The Incredibles, an animated film from the geniuses at Pixar about a family of super heroes who come out of retirement to save the world. We open with introductions to our main heroes, the first of which is called Mr. Incredible (Craig T. Nelson) who possesses titanic level strength and invulnerability. Elasti-girl (Holly Hunter) can stretch herself to near limitless lengths and lastly Fro-zone (Samuel L. Jackson) who can create ice. The opening events pose an interesting question, what if a citizen did not want to be saved? This is the dilemma faced by Mr. Incredible when he saves a random person from killing themselves. Instead of a thank you, the man, with the aid of a lecherous lawyer, sues Mr. Incredible. As media attention over the case increases, more and more people come out looking for similar compensation. With no other choice Mr. Incredible, along with all the other super heroes, go into government funded seclusion/retirement. Fast forward years fifteen years later and Mr. Incredible, whom we now know as Bob Parr, is married to Elasti-girl, Helen Parr, and is working for an insurance company. Clearly still depressed over his situation and lack of ability to help those in need, Bob continues to take chances if it means he can help others. When a secret message arrives from an unknown source asking Bob to aid them in their search for a missing robot Bob jumps at the chance. What starts off as a series of missions for an unknown employer becomes a blast from the past when Bob finds out that his new benefactor is none other than Buddy, an obsessed fan who Bob rejected as a boy and has now turned to a life of crime/revenge. When Helen realizes that Bob is in serious danger she takes it upon herself to go and rescue him, her children, fully aware that something is up, stow away aboard her plane. Once they reach the island where Bob is being held prisoner things go from bad to worse and they must band together to defeat Buddy/Syndrome and his giant robot. The movie has now reached Blu-ray coming jam packed with extras spread out over 4 discs. The first disc comes with the Blu-ray version of the film, a round table discussion of the film, and two short films. The second disc features include, a guided tour of the island paradise shown in the film, a look at the development of the story with the artist, and fun stories from employees of the studio. Disc 3 contains the standard version of the film along with the two shorts on disc one, Boundin' and Jack-Jack Attack. Disc four contains a digital copy of the film for movie lovers on the go. The Incredibles was a smash hit that possessed all the classic elements of great movie making; great story, well defined characters, and superb direction. Even though it has only been a few years since the movie premiered it has not lost any power or emotion; how could it? If you love movies, if you love comics, than you will love The Incredibles. 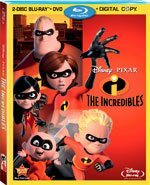 Download The Incredibles from the iTunes Store in Digial HD. For more information about The Incredibles visit the FlickDirect Movie Database.